I have two good friends on the inside of US Fish and Wildlife Service and National Parks Service. They’ve been coaching me. There’s a problem and it’s called mush. It’s what happens when good people get together with good ideas and good intentions and everything starts out clearly focused, but as things roll along, ideas and concepts start coming together in a piecemeal manner with too many voices, not enough leadership and eventually what emerges is … MUSH. Mush is as much the enemy as boredom (which I have whined about in the past). Sadly, in today’s Tea Party-beaten down government, it’s a serious problem. I feel bad for a lot of these government workers. They want to lead, but the voices of opposition have gotten so oppressive from both ends of the spectrum—far right AND far left—that mush seems to become an inevitability. It’s limited how much can be done to combat it, but the one aspect I hope to help with in my talk is at least making the language somewhat simpler and more clear. One friend sent me a 200 page document they were told to digest and incorporate, but the writing is so bloated and mush-laden that I can see it must be depressing. 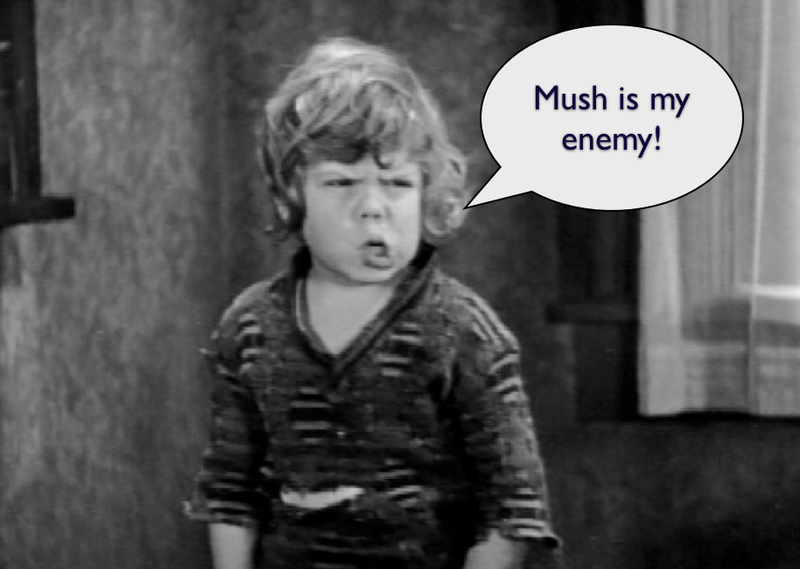 There’s only one solution — we must make mush our enemy.